In 1522 Malta was a barren rock with little to recommend it. 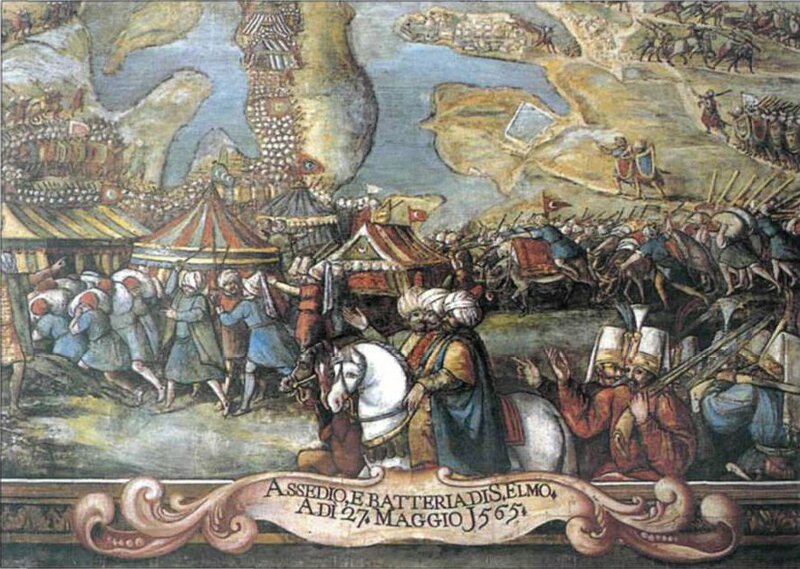 As the exiled Knights of St John arrived after having been driven out of Rhodes by Suleiman the Magnificent and his Moslem Army, they must have been dispirited by their new surroundings. Gone was the green island where the delightful nectarine, fig and vine grew. Now the principal crop was cotton, stretching across a landscape of dusty yellow sandstone. Surprisingly though, the quote ‘This Cursed Rock’ was not taken from one of those devout religious warriors as he first set eyes on Malta. 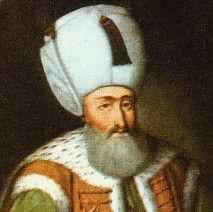 Instead it was taken from an adviser to their deadliest adversary, Suleiman the Magnificent, responding to the acts of piracy by the Knights of St John. 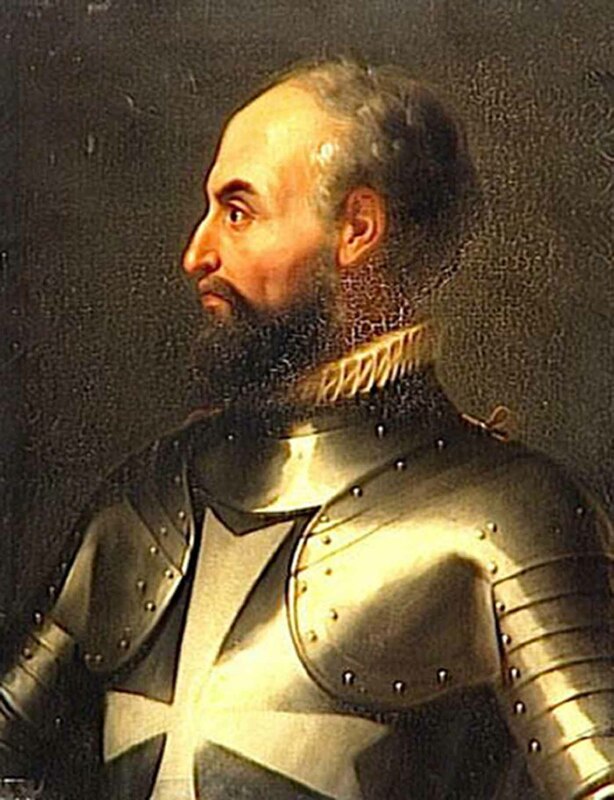 This was because, far from settling down to a period of peace and rest, the Order had quickly built up the Island to become a painful thorn in his side with their galleys gliding out of the Grand Harbour to attack his shipping and make hostages of his courtiers. In 1565 the Sultan’s patience with their depredations on his shipping channels in the Mediterranean finally snapped and he gathered together a formidable army to finally put an end to this nuisance. The siege of Malta – the attack on ‘This Cursed Rock’ had finally begun. This blog is about game design and how a game develops from an idea into reality (hopefully!). That – for me at least – it is a process that can take years with plenty of stops and starts and wrong turns along the way. Shows the Fort of St Elmo where the Turks were delayed sufficiently long by the outnumbered defenders to make a major contribution to the failure of the siege. Many thanks to Whatambush of BGG for bringing this to my attention! 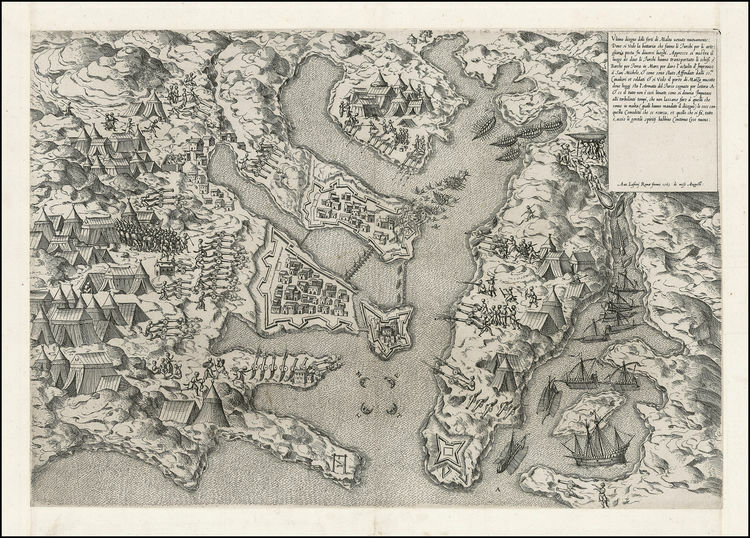 There aren’t that many early maps of the siege, especially ones that encompass the playing area I envisage for the game. The best example is the print above. However it needs to be stripped back to its basics for play testing, particularly as the number of locations (essentially movement points) will very much dictate the pace of the game. Getting them right will be a crucial element in the design. A very kind colleague at work had offered to remove all the ‘unnecessaries’ but they have been exceptionally busy and I could see the project getting pushed further and further back. Happily a knight in shining armour, Simon Dasmacht, stepped into the breach and has done a sterling job, so we are just waiting for some gaming parts to arrive from Germany to get started on early playtesting. I met Simon at a wargaming weekend in Liverpool where we were opponents on a game of ‘It Never Snows’ and we have exchanged several geekmails since on various stuff including a shared interest in OCS. 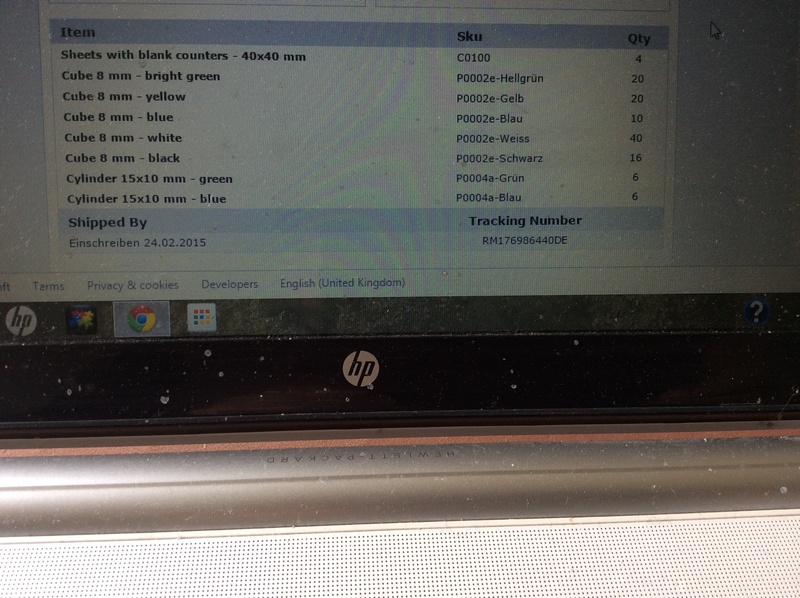 Confirmation of the order from Germany. I’ve done my usual and ordered more than I need. By the way, I’m notorious for spending hours deciding what to buy and then ordering the wrong things. Don’t think I have here though. C: Once the card is committed to an enhanced action it cannot then be used for an immediate action. You are mortgaging that turn on being able to do what you planned for. In a game of limited turns that matters. However, the balancing act here with the design is to work in player interaction without making it just a series of frustrating actions and counter-actions. Essentially a You build, I knock down mentality. I wouldn’t enjoy that and unless people are massive Jenga fans, they probably aren’t going to enjoy it either. The enhanced actions list is in a bit of a state of flux but I’ll post the Turkish player’s list (they are specific for each player) so you can get an idea of where I am at. Getting the turn sequence right is difficult. Also deciding how much information to include. I have put the turn summary here so you can make your own mind up. Event Card phase probably contains the most complex part of the game because of the multiple uses of an Event Card and the fact they can be used in more than one phase. I have added a Sequence of Play Summary that can be printed off for some bedtime reading. 3.1 Place Leader Phase: Personality discs are placed in a location chosen by the players. The Turkish player places all of their discs in a Turkish controlled location. The Knights of St John player then places all of their discs in a fortified location. Only one leader is permitted at each location. IMPORTANT: They do not move from this location until the next turn. 3.2 Event Card Phase: Both players each draw one event card from the event card deck. The Turkish player draws their card first. This card is not revealed to your opponent unless it is a ‘MUST PLAY’ card, in which case it is played for its event straight away. Different Event Cards can be played at different times during the turn. A brief instruction at the bottom of the Event Cards will tell you when. The Turkish player decides first whether they want to play an event card for its event in this phase. Neither side has to play the event card they have just drawn. They can play ones they drew earlier on in the game. IMPORTANT: Only one event card is ever played for its event during each turn. It’s placed on the event card played box on the map to remind you and discarded in the clean-up phase. 3.3 Action Card Phase: Both players then choose four action cards from their deck of twelve action cards to play in this phase. These cards are played alternately by the players either for IMMEDIATE EFFECT or into the RESERVE for ENHANCED EFFECT. One extra event card may also be played as an additional action effectively giving the player the possibility of five actions in the turn. Event cards marked (action phase) may also be played for their events in this phase. IMPORTANT: The event card played for an additional action does not count towards a player’s limit of one event card per turn as they are being used for an action. 3.4 Assault Phase: Turkish player may assault any fortified areas where he has placed an assault or sustained assault marker. Relevant event cards can be played in this phase. 3.5 Clean-up phase: Remove all personality discs from their locations. Take any event cards (which have been played for their event) from the map and place in the discard pile. Calculate any adjustment to the arrival of the Main Relief Force from Sicily. Increase the Turkish ammunition level by one. Move turn counter on the turn track up by one. The rules are coming on at a great pace. The breakthrough was reading about the ‘Time of Crisis’ game (on the P500 list for GMT). It described how the player could draw certain cards to do certain actions. Although this game is on a completely different scale the door which had seemed closed to me – how to power the game – was unlocked. It also allowed me to consider how using combinations of actions cards could produce enhanced effects. Now I have ‘immediate actions’ – created through the play of a single card, and ‘enhanced actions’ created by a combination of cards being played. Planning is now rewarded! One of the criticism of card driven/card powered games is that you don’t have the right cards at the right time. Whilst the game includes event cards which are randomly drawn during the start of each turn (one card per player), you don’t suffer from the ‘why do I need a fire card to fire’ syndrome. If you want to do combat and you didn’t choose a combat action card for your turn – it’s your own fault! Want to move and didn’t choose a move action card – the buck rests with you. Read the rules yourself! Bear in mind that these are rules under construction and subject to constant revisions. There are also some examples of the event cards. One of which, per turn, can be used to double as an action card! Being a mainly traditional hex and counter man my initial idea was to have it like a traditional wargame. Counters for units, hexes for movement, jumpers for goal posts. Well, maybe not the last one. However, as you will see from the notes I was thinking of to hit values with a 6 to hit knights – with their ‘bullet proof’ armour. Not an anachronistic term by the way, Balbi speaks of it in his account of the siege.. 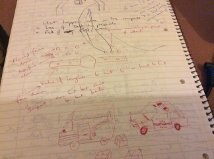 The pictures next to it shows where my intellectual musings were interrupted by my son who wanted me to draw the police car and mail van from the popular BBC series ‘Postman Pat. 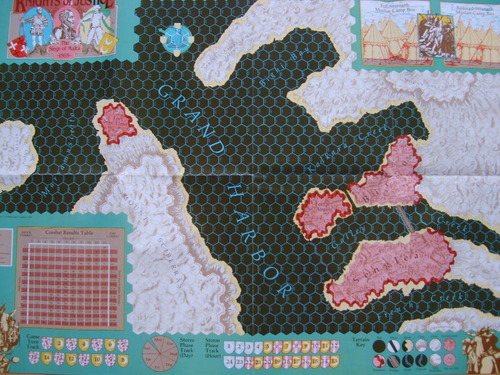 Over three years ago, inspired by the excellent Ernle Bradford book on the Siege of Malta, I tried to find out on Boardgamegeek if a game existed on the topic. The only one that people could really refer me to was ‘The Knights of Justice’ (1986) a magazine title. Having tracked down a second hand copy, I was instantly turned off by the map and the NATO symbols on the counters. The vibrant clash of colours on the map gave me flashbacks to the sequence in ‘Dumbo’ where he has a nightmare after a trying out alcohol for the first time. The NATO symbols just felt completely wrong. I have to admit that I didn’t even bother to look at the rules. My quest then changed from finding a decent game on the topic to creating my own. 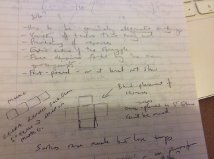 My first attempts were scribbled down in an old spiral bound notebook towards the end of 2012. The principles I laid out here have kept me company throughout the design. I hate nothing more than the sensation that I am effectively strapped in for the ride. I have to follow one path to victory and the game is not designed as a game but more of a re-enactment, thereby hitting that goal of being a truly historical simulation. However the History matters too – and therein lies my dilemma. As the link shows, by 2013 I was talking about ‘fiddling with a design’ but as I point out in my post I needed to make it as exciting as the book by Bradford. Now that was a challenge.